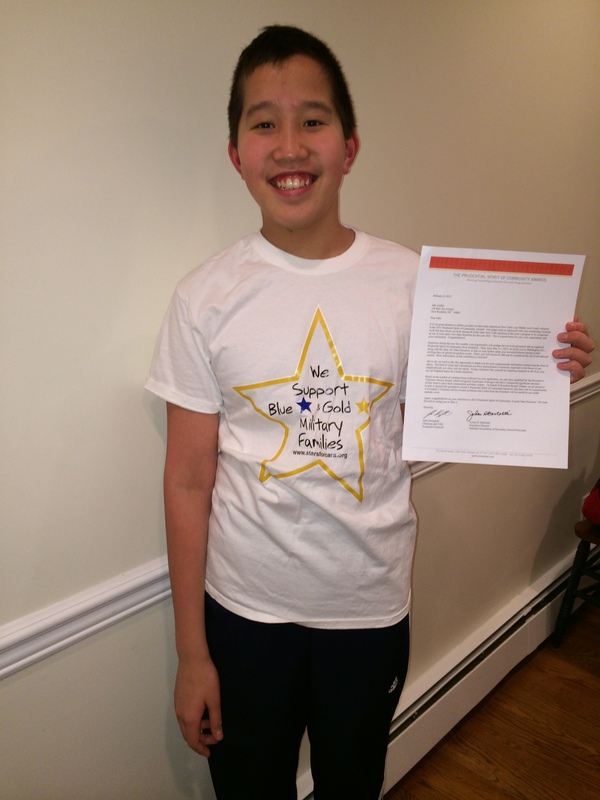 It was announced today that I have been selected as New York State’s Top Middle Level Youth Volunteer for the prestigious Prudential Spirit of Community Award. This is the largest youth recognition program based solely on volunteer service. I am very humbled by this award. Thank you to Alisa H. Kesten, the Executive Director of Volunteer New York! who nominated me. Because of her I am able to let more people across Our Nation know about the “3 Holidays Announcement.” So far more than 100 schools are saying this on Patriot Day, Veterans Day, and Memorial Day across New York State. Thank you to those schools. I accept this award on behalf of the brave Military Families and especially for Teresa Arciola, who inspired me to found Stars for Cars when I was 8 years old. This award will help me tell the Arciola’s story of love and sacrifice. Thank you to all “Blue Star” and “Gold Star” Military Families. I do this for you.